After looking at this powerful work, it may not surprise you to learn that Phillips is a former firefighter. (Bill left the profession after 16 years when he began to earn a living through his art.) 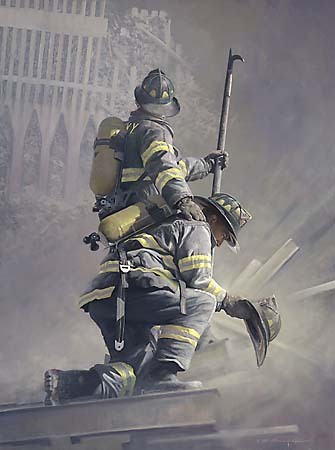 Bill has painted this iconic and heroic work of art to support firefighters nationwide. He hopes that the outpouring of support for New York fire fighters continues to raise awareness and appreciation for the everyday, unsung heroes in communities everywhere. The Greenwich Workshop will donate a portion of proceeds to the National Fallen Firefighters Foundation to benefit families of lost firefighters nationwide.